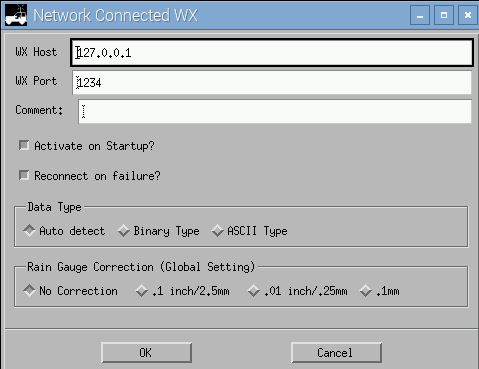 This post will show you how to generate weather data from LA Crosse WS2300 series weather stations for submission to the APRS network. APRS software I’m using is Xastir, but you can use this setup to push the weather data to other APRS applications also. Digipeater mode is already set up in Xastir. This post will not cover digipeating WX data. is connected via USB to RS232 converter so the device is ttyUSB0. Also, don’t change the units, bash script will automatically convert them to be compatible with APRS network. 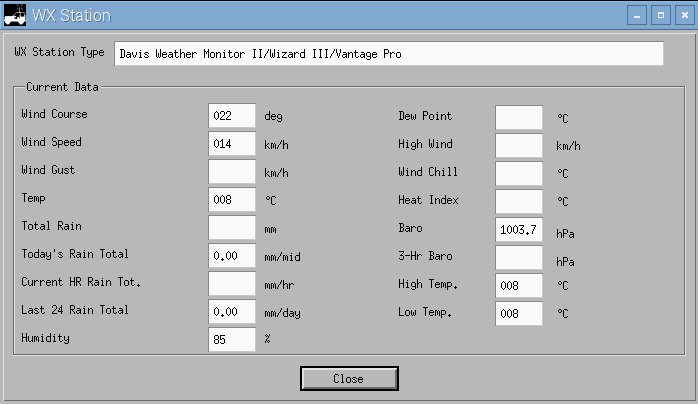 #This script reads weather data via fetch program which is part of Open2300 suite written by Kenneth Lavrsen (http://www. #serve the fetched output to Xastir. #Ncat is part of Nmap, get it by installing Nmap. #This script should work for LaCrosse weather stations, WS23xx series. Testing was done with WS2307. echo "ncat already running, nothing to do"
Save and start the interface. I’ve just implemented your script and i’m having problems with the temperature readout in xastir. this is what is coming out of the script. Xastir sees this as -11 degrees c.
APRS temperature format is in fahrenheits. So, if you convert t011 (which means 11F) to celsius you get -11°C. Was wondering if anyone has done this for the Acurite 5 in 1 wx station to be able to have Xastir use the wx data from it?? It has a serial USB connection but I’ve not got any combination of settings to work just in case its format was the same. I’m sure it needs some coding and a coder I’m not.